Since my accident at the Scott 24hr last October, I must admit I have had trouble making decisions about races. The list of events in the pipeline is very long and typically includes events which involve riding my bike for many hours, if not days, at a time. Always my mind says yes yes yes when adding them to the list, but as of late, the body keeps saying no. The coming months are full with potential events including Back Yamma Bigfoot, Kowalski Classic, the Scott 24hr, Terra Australis, Crocodile Trophy, the Highland Fling 100 miler, HuRT and the rest of the Chocolate Foot Singletrack Mind series. With my shoulder still not entirely happy, some choices need to be made. However, remembering back to April when a week out from solo 24 hour nationals and I still hadn’t made the choice to ride or not, it seems apparent that my decision making approach could do with some tweaking. I just don’t seem to be able to include the injury into the calculation when it comes to crunch time. I can see now though, that with big events on the cards including one overseas, that I need to get serious. The reality is that my shoulder is weak. I guess I shouldn’t be surprised after four dislocations and two lots of surgery. It can handle about 7 to 8 hours mountain biking on singletrack, longer on firetrail and has been fine for any amount of time on the road bike. So, if it’s not working, change your approach. I need a new approach to choosing events instead of laboriously umming and ahhhhing for days, wishing I could, knowing I probably shouldn’t. I need to be able to decide faster. Fast like a ninja? Back Yamma Bigfoot – Flowy, fast, less technical hence less demanding on shoulder, 100km. Staying on the list. BAM! Kowalski Classic – Twisty, all singletrack, medium technical, demanding. Fun ride with friend on the Hume Hovell track that weekend. A little bit of eeni-meenie-miney-mo and…POW! Off the list. The Scott 24hr – Very technical and tough, can’t ride sections of the course, shoulder not ready for 24 hours of singletrack. As much as I want to, I know I can’t. This is the hardest to decide on, but alas, off the list. GONE! Terra Australis – Already sorted out accommodation, tough race but less technical, my endurance fitness is good at the moment, opportunity to rest / ice etc overnights. Staying on the list. YES! Crocodile Trophy – Not prepared even in the slightest for this at the moment. As fast as a ninja chop this one is off the list. Highland Fling 100 miler – tough, might be too close to Terra. Not unachieveable. Mix of firetrail and singletrack. Not technical. OK! HuRT (Hunter Race Trail) – Lots of techy singletrack, could take me 30 hours. I don’t have the strength to hike-a-bike fully loaded time after time at the moment. Soon, but not yet. Off the list. Chocolate Foot Singletrack Mind series – Coming second in the series. Super fun events. Seb is already entered for them all so we will be going anyway. Of course these are staying on the list! Well, there we go, that is a start anyway. Don’t hold me to it, but at least that is some choices. I’ll see you at Back Yamma Bigfoot people! This entry was posted in BikingBethany and tagged shoulder on August 30, 2012 by bethany. It has been a while between posts! What have I been up to? The Easter solo 24hr national championships have been run and won, many weeks of nothing cycling related followed, and last weekend the first round the Chocolate Foot Singletrack Mind series was held in Orange. It is hard to say why I raced the Easter 24hr in the end, because in hindsight it was a silly thing to do both from a physical and mental point of view. In between buying and moving house and changing epilepsy medication, I had put in all the race preparation that I could. I felt fit on the road bike but hadn’t done much mountain biking. The weekend before Easter I was entered but still undecided as to whether I would actually race. This should have been it, the warning signs to tell me I just wasn’t committed to this race 100%. But the competitive desire was still very much there and the little voice in the back of my mind was egging me on, saying “do it, prove to yourself that you can fight and beat all this stuff that has been happening to you”. So I did it. Well, not quite. I made it through seven hours. But by the seven hour mark I was not able to control the bike or properly able to hold the bars with my right arm. Sure I might have been fit on the road bike but oh how I had underestimated how much strength was gone from my back, shoulders and neck over the last six months. Back sore, triceps cramping, I basically threw my bike at Seb and said “let’s go get pizza”!!! It was almost harder to walk away from the race than crashing out at the Scott, but I knew it was the right thing to do. Unmotivated. Bleh. Chocolate. Sleep. These were the thoughts throughout the weeks to follow. As Seb and I describe it: losing one’s cycling mojo. A love of bikes, a love of riding bikes, racing bikes, talking about bikes, thinking about bike races and bike holidays. This was my cycling mojo, and it was gone. For a while I didn’t try and find it either. Rather, I buried myself in work, packing up the house for the move, and even did an 8hr rogaine with my mum! But one sunny Sunday afternoon Seb and I decided to head out for a mountain bike and there, on Bruce Ridge and Black Mountain on my Merida 26er, I found my cycling mojo again! It turns out that I didn’t really need a break from cycling, but actually needed a break from my 29er. As dearly as I love my Superfly, I know now that there is a time and a place for it. I had lost my ability to corner confidently, to use my upper body to lift over obstacles and to get out of the saddle and work! Since getting the 29er I had slipped into this world of sitting down and banging over things because I knew the bike could handle it. I was crashing nearly every time I rode my bike, and actually dreading corners because I felt so unco. This was not a good place to be in mentally. So, with the Superfly out of action because of a crack / warranty issue, I pulled out the Merida for some fun! Last weekend we moved house to Duffy, Weston Creek and we are now a mere stone throw from Mt Stromlo which is so exciting! 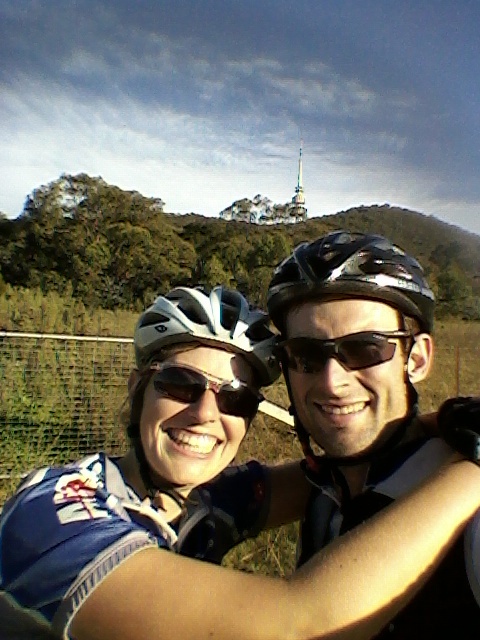 Can’t wait for plenty of fun rides to be had at Stromlo and now we can have post-ride coffee at our place! After moving our entire house on Friday night / Saturday morning, Seb, Ria, Pete and I drove to Orange for round one of the Chocolate Foot Singletrack Mind series. 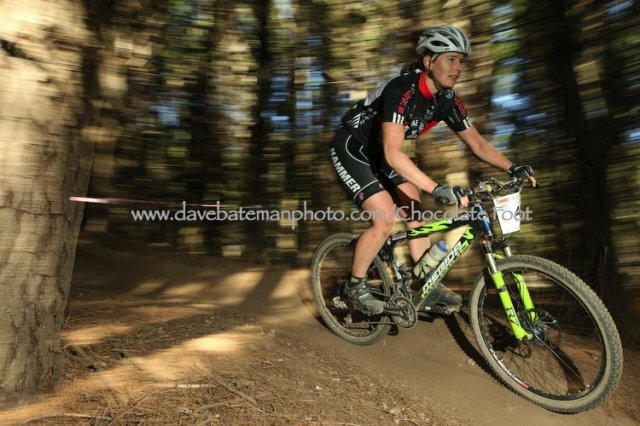 The track was so awesome, the Merida was fantastic and best of all, my shoulder was strong with no issues! I had no expectations for myself except to ride and have fun, which is exactly what I did. I got 5th, a few laps off the female winners. Ed McDonald, also On the Rivet, had a cracker race and took out the solo men’s category. Seb and Ria (Sebria) also had a great race, coming 2nd in the mixed pairs. 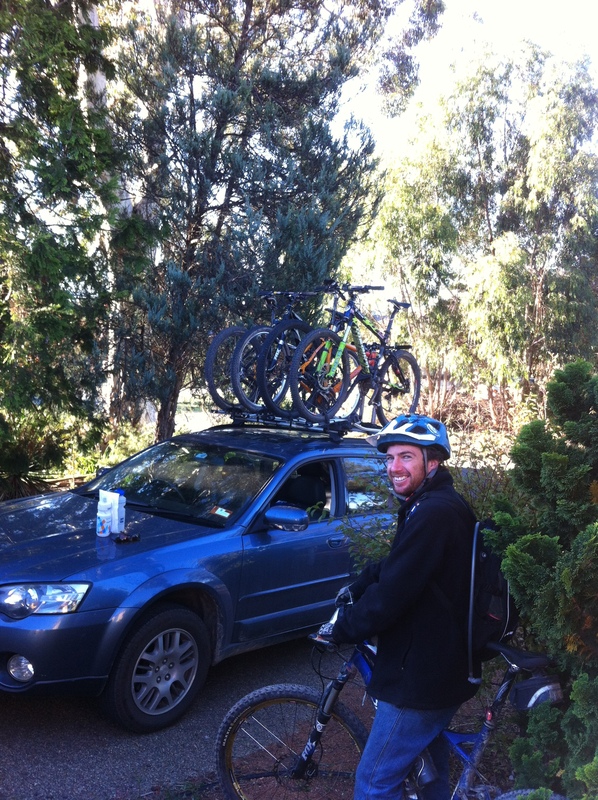 Four bikes on the Subie – don’t we look pro! Can’t wait to get out there and rip up some more singletrack: hello mojo!! Races coming up include Willo Enduro, all the Singletrack Mind series, possibly Tour de Timor and Terra Australis! This entry was posted in BikingBethany and tagged shoulder, Solo 24 on May 2, 2012 by bethany. The last six months have been quite tough for me, both physically and mentally. 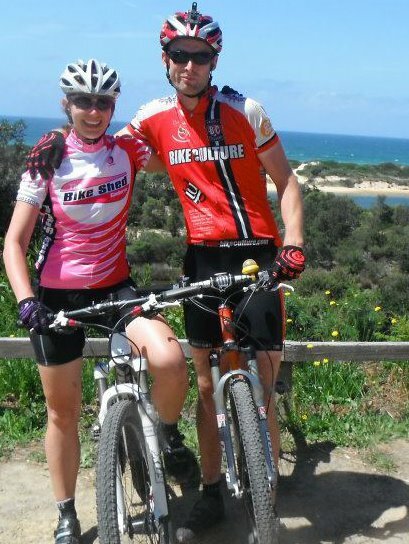 The start of 2011 was off to a great start with Otway Odyssey, Solo 24hr Championships and Alice Springs Enduro all completed with big dusty and muddy smiles. Other fun events included James Williamson Enduro and Capital Punishment. I also got hooked on the NSW Chocolate Foot enduro series, taking out second place at the Mt Annan 7hr round. Things were looking great, and with no hesitation I signed myself up for the Scott 24hr solo. And after discovering that this was a qualifier for World Solo 24hr champs in Italy, with flights included, I had my heart set on winning that race. Over three months on spin bikes and loads of physio and I was back! The feeling of whizzing around on the bike through the forest was hard to beat, and I began planning my calendar for 2012. With Worlds completely out of the question, I turned my focus to the Easter 24hr national solo 24hr champs. Majura! Yes! This is where mountain biking all began for me, plus, it is at my back door step, so why not?! Again, after a second mammoth attempt to rebuild the fitness I had lost since October, I began training like a crazy person. I was feeling fantastic until one afternoon I started feeling dizzy, and shaky. Then it happened again later that week. And again. After getting some tests done, the neurologist confirmed that I still had epilepsy, which we thought had simply been a childhood thing I grew out of. I was pretty saddened to be told that I will have to take medication for life to keep me ‘all chipper’. But, on the other hand, there is nothing more satisfying than rising up to the challenge. SO… as the challenge of all challenges, my just-as-crazy partner Seb and I plan to ride the Tour Divide next year, and this blog will be the forum for all our human-powered adventures on route to getting fit to ride the Rockies! Can you handle Black Sebeth? This entry was posted in BikingBethany and tagged Epilepsy, shoulder, Tour Divide on March 29, 2012 by bethany.